Quebec Premier François Legault said he was disappointed with the Ontario government’s recent decisions to cancel a planned francophone university and cut the office of a French-language watchdog, asking Premier Doug Ford to reconsider during the pair’s first face-to-face meeting Monday. Mr. Legault’s visit to Queen’s Park was overshadowed by the Progressive Conservative government’s decision to cancel plans for the province’s first francophone university – which Mr. Ford had promised to keep during the election campaign and again shortly after taking office. In the government’s first fiscal update last week, it also said it was cutting the French-language services commissioner’s office and rolling it into the ombudsman’s office. Two other watchdog offices were also axed. 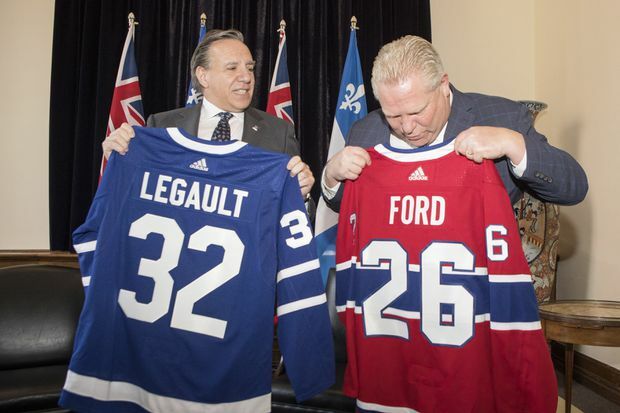 Quebec Premier Francois Legault, left, exchanges hockey jerseys with Ontario Premier Doug Ford at Queen's Park, in Toronto on Nov. 19, 2018. Mr. Legault, who told reporters he was generally “very happy” with how the meeting between the two former businessmen went, said Mr. Ford disagreed when he asked him to reverse course. Mr. Ford defended the moves as fiscal necessities, telling reporters the province already offers more than 300 French-language courses at 10 universities and colleges, which are not at capacity. He also noted the province recently cancelled the previous, Liberal government’s plans for three satellite campuses of English-language universities. “The difference between myself and Premier Legault, and I told him this, ‘You inherited a $1-billion surplus, I inherited a $15-billion structural deficit.’ And he understood that,” Mr. Ford said. “This has nothing to do with the personal against any Franco-Ontarians." The moves in Ontario had repercussions in Ottawa. Federal Official Languages Minister Mélanie Joly called them “unacceptable” and is pressing all federal parties to come to the defence of Franco-Ontarians. Ms. Joly, describing federal Conservative Party Leader Andrew Scheer as an ally of the Ford government, has been calling on him to denounce the moves. She said Monday she hopes the Conservatives will have the “political courage” to support the more than 600,000 francophones in Ontario. “Unfortunately, Mr. Scheer has yet to denounce the situation,” Ms. Joly said in Ottawa, with the federal Tories aiming to make gains in Quebec in next year’s federal election. Mr. Scheer told reporters on Sunday that he “expressed his concerns” to Mr. Ford about the decision to cancel the university but did not ask him to reverse it. In a statement on Monday, Mr. Scheer accused the Liberals of playing “reckless and cynical political games." The decisions could also expose the Ontario government to a court challenge, according to Benoît Pelletier, a constitutional law professor at the University of Ottawa. The former Quebec Liberal cabinet minister said the courts already sided with Franco-Ontarians in their battle in the 1990s to save the Montfort Hospital, a key organization in Ottawa’s francophone community. The Ontario Court of Appeal ruled in 2001 that the Montfort was protected under the Constitution as being vital to the survival of province’s francophone community. Editor’s note: Due to an editing error, an earlier version of this story mistakenly said Ontario's PC government had promised, during the last election campaign and shortly after taking office, to cancel the province's first francophone university. In fact, the PCs had promised to keep the university. This is a corrected version.